The principal of Cria Genesis, Jane Vaughan, has been working with alpacas and llamas since 1991. 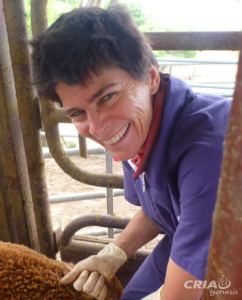 Jane graduated with a Bachelor of Veterinary Science (Honours) from the University of Melbourne in 1988, gained membership to the Australian and New Zealand College of Veterinary Scientists in the Ruminant Nutrition Chapter in 1998 and completed a Doctor of Philosophy in the control of alpaca ovarian function in 2002. Jane performs commercial embryo collection and transfer in alpacas throughout Australia, New Zealand and the United Kingdom. She also provides nutritional advice and Johne’s disease Market Assurance and Q-Alpaca programs to alpaca breeders in Australia. Jane lectures regularly to farmers, veterinarians and veterinary students on alpaca reproduction, nutrition and husbandry in both Australia and internationally, and has co-authored a number of papers in refereed journals. She is a past-President of the Australian Alpaca Veterinarians (AAV; a special interest group of the Australian Veterinary Association) and is the current Secretary and Newsletter Editor of the AAV. In collaboration with various universities, Jane has on-going research interests in reproduction, parasitology and genetics of alpacas. Jane travels nationally and internationally to provide the services offered by Cria Genesis. Read more news in the blog.